Remodeling Designs Earns 2017 Guildmaster Award - Remodeling Designs, Inc.
Remodeling Designs, Inc. is honored to receive the 2017 Guildmaster Award from GuildQuality. The award is given for demonstrating exceptional customer service within the residential construction industry. We couldn’t be more excited to win the prestigious award dedicated to our clients. We focus on our customer’s experience from start to finish. Receiving such positive reviews from our clients makes our work worthwhile. An award like this is a testament to our team and our wonderful clients. 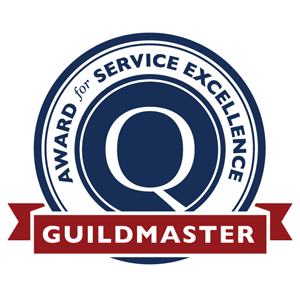 In determining which businesses receive the 2017 Guildmaster Award, GuildQuality reviews thousands of survey responses submitted by customers of Guildmaster candidates. They also consider two primary metrics for each candidate: the percentage of customers stating they would recommend the business to a friend and the percentage of customers who respond. Remodeling Designs, Inc. achieved a recommendation rate of 97% from their customers surveyed by GuildQuality. Thank you to our wonderful clients for taking the time to give feedback on their remodeling projects.